Galicia’s green, misty hills, rugged coast and bracing Atlantic winds (not to mention the local bagpipers) are more reminiscent of Ireland or Brittany than the image many have of Spain. In fact, Spain’s geography is strikingly diverse and in this corner of Green Spain, the cooler microclimate helps local wine makers produce exquisite, aromatic white wines. Albariño was traditionally the “king of grapes” here and these zippy wines from the Rias Baixas pair smashingly with the traditional seafood so popular here. Few things are more sublime than Galician octopus sprinkled with paprika and olive oil and served with a good Albariño. Bliss. Other grapes that are getting a lot of attention from international wine critics and experts include Godello, considered to be Spain’s most “up and coming” white wine grape. Albariño and Godello are both used as single varietal grape wines, and blended with other local varietals such as Treixadura, Loureira and sometimes Caiño blanco. And indeed, red wines (generally light reds) are also made in Galicia, usually in Valdeorras with the Mencía grape (the main red varietal used in nearby Bierzo). Other wine regions in Galicia include Monterrei, Ribeiro and the absolutely beautiful Ribeira Sacra. 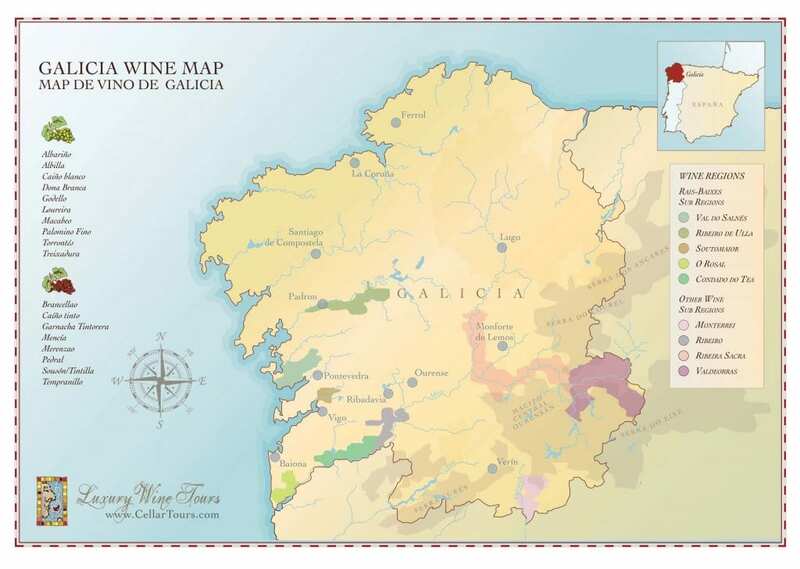 Embed Galicia Wine Region Map on your site: copy and paste the code below.